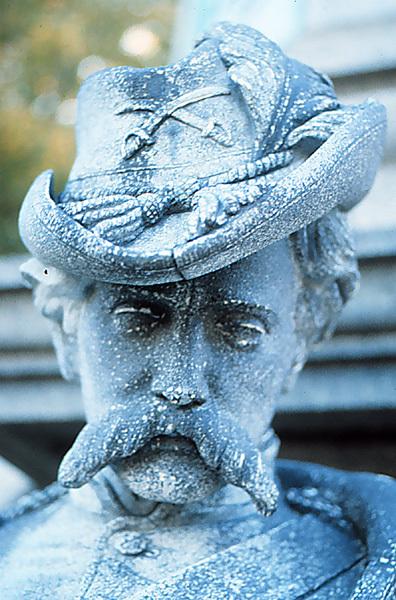 Beginning in the 1870s, inexpensive monuments in American cemeteries began to be made of zinc. While many of these are in surprisingly good condition, others have begun to deteriorate after a century outdoors. Understanding how these monuments were made, what they were meant to look like, and what treatments are suitable for them provides a sound basis for preservation of this heritage. The Monumental Bronze Company in Bridgeport (CT) and subsidiaries in the U.S. and Canada produced the most commonly found items using a unique methodology that included a sandblasted finish to imitate the mat appearance of stone. Marketed as superior to stone in terms of durability, their products were referred to as "white bronze." They included thousands of markers (Figs. 1, 2), custom-made effigies of the dead, off-the-shelf statues of Faith, Hope, and Charity, and enormous Civil War memorials crowned by statues of soldiers (Fig. 3). Using a more conventional technique, the New York-based firms of J.L. Mott Iron Works and J.W. Fiske sold zinc statues of soldiers and firemen painted in imitation of bronze to veteran's groups and municipal governments (Fig. 4). 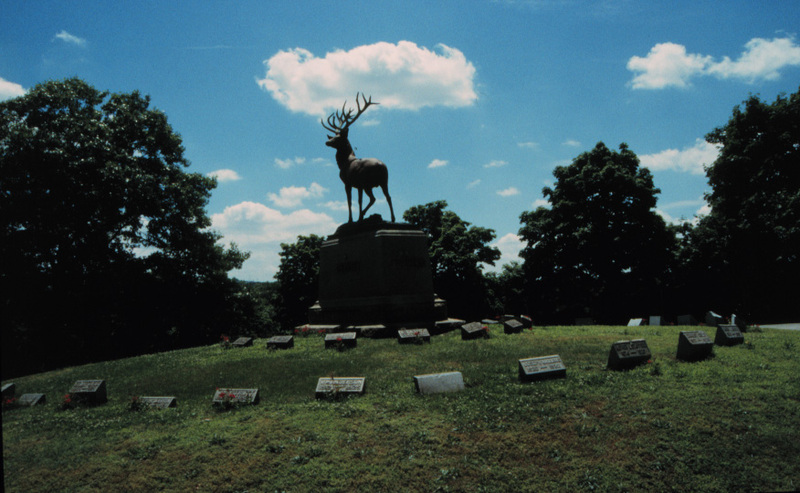 These two companies also carried a naturalistically painted or bronzed Stag, which could be encircled by tombstones of members of the Benevolent Order of Elks for Elk's Rest Memorials (Fig. 5). Their cast-iron fountains with classicizing zinc statues were occasionally placed in cemeteries, originally painted light colors in imitation of stone. 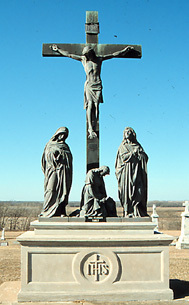 By the early 20th century, even as production by other companies waned, the Daprato Statuary Company in Chicago introduced copper-plated zinc Crucifixion Groups for Roman Catholic cemeteries (Figs. 6, 7). They continued to be sold as late as the 1950s. 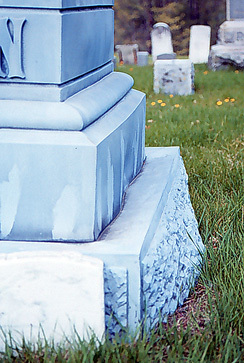 The most common damage to zinc cemetery monuments is breakage of the brittle metal and separation at seams where components were joined at the foundry (Fig. 8). This can usually be remedied by soldering and other metallic repair techniques or by using epoxy or polyester resins. Zinc is subject to "creep" (permanent deformation over time), which may become visible when loadings are appreciable. Small white-bronze markers may begin to bulge when foundations are inadequate (Fig. 2), and large monuments may become insecure. Irreparable damage invariably results, however, after concrete is poured inside sagging monuments in attempts to provide support (Fig. 9). Such treatment should be avoided at all costs. New stainless steel armatures should be installed instead. 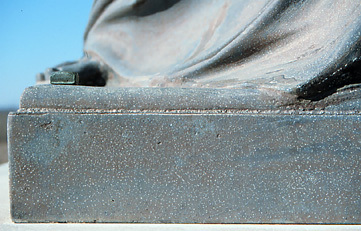 Corrosion is a potential problem for any metal monument, especially in highly polluted or seaside atmospheres. Nevertheless, white-bronze monuments, which were meant to remain unpainted, survive remarkably well. Perhaps this is because the cast metal was relatively pure (more than 99% zinc) and the joining metal was also composed of zinc. 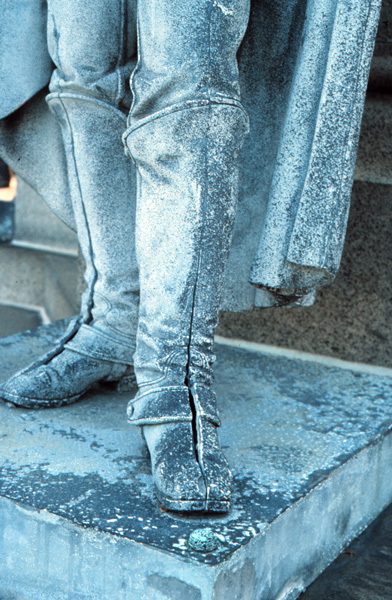 For statues of the type that were originally painted, corrosion can be limited by regular painting. 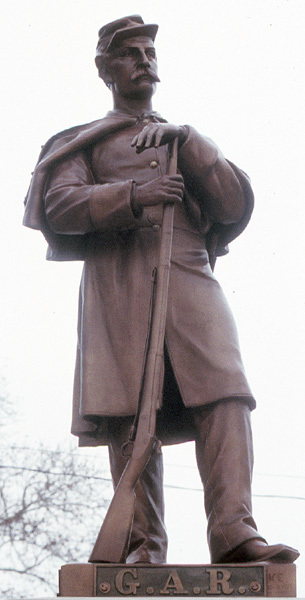 The GAR Monument in Pottstown (PA) provides an excellent example of a new "bronze" finish on a statue that was originally bronzed (Fig. 4). 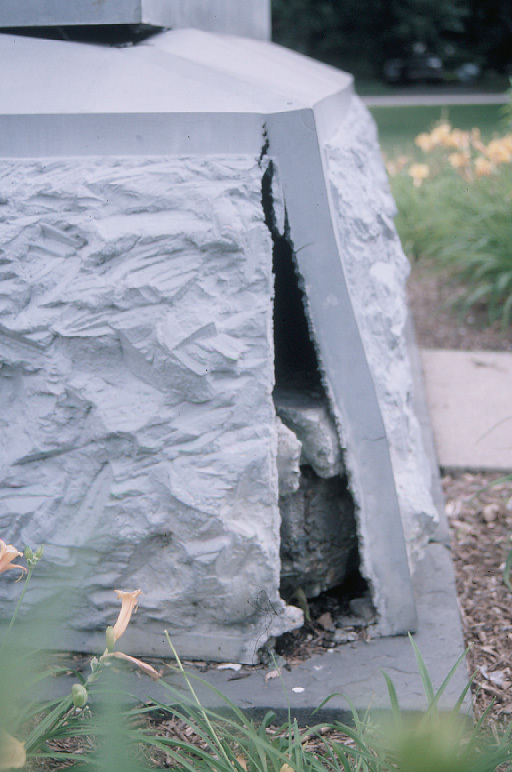 In contrast to these painted finishes, copper-plating on zinc invariably results in severe pitting, without good options for remediation when monuments are outdoors (Fig. 7, 10). 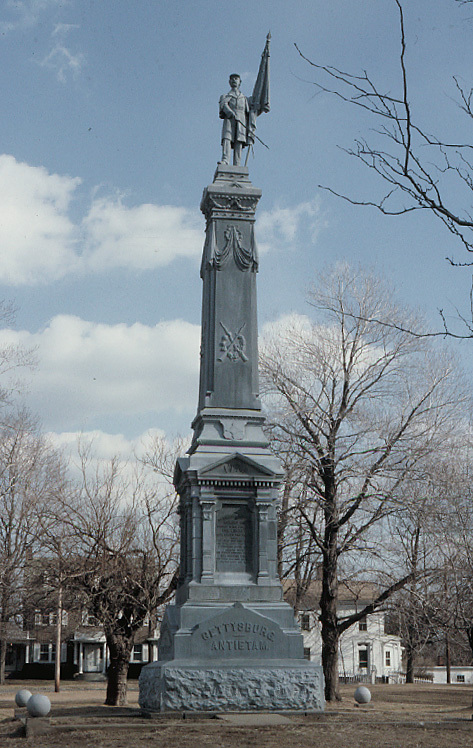 In the case of copper-plated zinc statues on the City of New York Civil War Monument, pitting was so severe that statues were recently copied in bronze and the originals placed indoors.